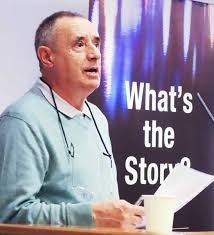 The February talk of Skerries Historical Society saw prolific local historian, Frank Whearity, back in the spotlight with The rise and fall of John Spicer’s ‘Model Bakery’, Balbriggan (1904 – c.1999): Part 1, 1904 to c.1942. Despite the presence of the name ‘Balbriggan’ in the title, this story is very relevant to Skerries people. 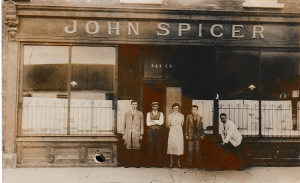 Our story begins in Navan where John Spicer was born in 1853. By 1902, he had built up quite a business there with two flour mills (the Boyne and the Blackwater Mills), a Bakery and a coal yard. But that wasn’t enough and when the Cumisky Brothers decided to sell their Balbriggan bakery in 1903, John Spicer saw the perfect opportunity to expand. He was prepared to invest in the best and had a whole new bakery built a few hundred yards down the road from the old Cumisky concern. Whether or not Fingallians were swayed by this argument, there is no doubt that Spicer’s bread began to be seen, not merely in Balbriggan, but also gracing the tables of Skerries’ residents. Which was not at all welcome news for the bakers already established in Skerries. Worst hit was Ennis’s of Skerries Mills. They had, for years, held the lucrative contract to supply the Balrothery Poor Law Union at Ballough, with bread and meal. Within six months of Spicer’s being established in Balbriggan, they had won the Workhouse contract. William Ennis didn’t give in without a fight and the contract seesawed between the two bakeries for a good many years. One year Ennis tried to renegotiate a contract a few short weeks after winning it from Spicer’s. The board of governors rejected his appeal and said if he wanted to change his terms, the contract would have to be retendered. Then there was a claim that Spicer’s were supplying underweight loaves. Several of the members of the board of guardians disputed the fact but the contract went to Ennis’s that year. During the First World War, Spicer’s bread was found to be too ‘white’ – white bread was more popular but too much of the milled wheat was wasted. A country at war couldn’t afford to waste food. Frank had many tales to tell about business rivalries and the characters who worked in the baking trade. He’ll be back in the not too distant future to take the story up to c.1999 when the bakery finally closed.